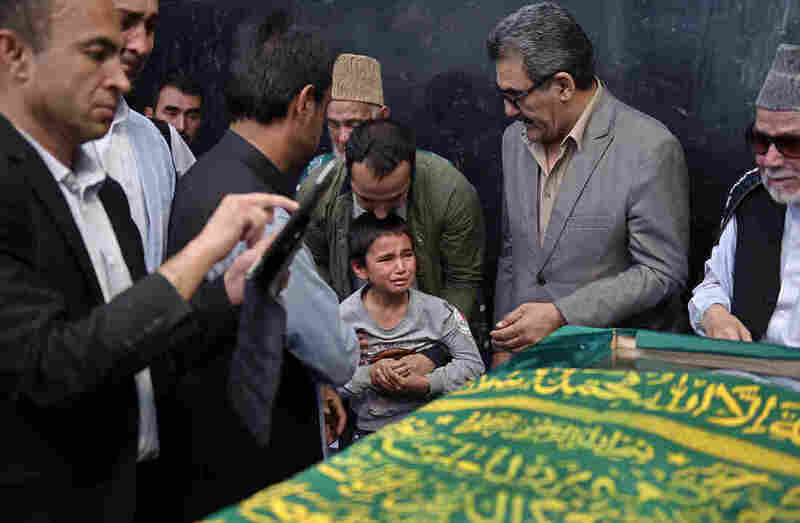 Afghan Journalist Zabihullah Tamanna Laid To Rest In Kabul : The Two-Way Tamanna died on Sunday, along with NPR photojournalist David Gilkey, when the Afghan convoy they were traveling in was attacked by Taliban fighters. Relatives carry the coffin of Afghan journalist Zabihullah Tamanna ahead of funeral prayers Tuesday in Kabul. 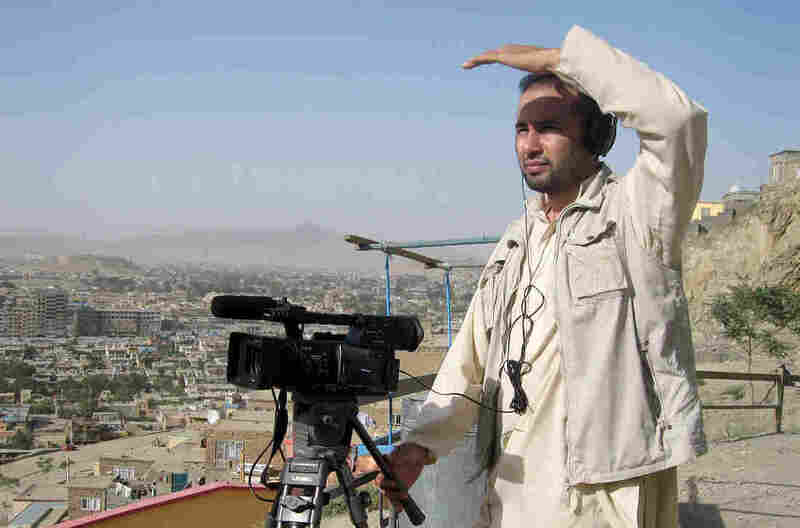 Tamanna, a 38-year-old father of three killed alongside NPR photographer David Gilkey in a Taliban ambush in southern Helmand province, is seen as one of the many unsung heroes of Afghanistan's media landscape who put their lives at risk to report on the conflict. Zabihullah Tamanna, the Afghan journalist who was killed on Sunday along with NPR photojournalist David Gilkey, has been laid to rest in Kabul, Afghanistan. Zabihullah and David died when the armored Humvee they were riding in, part of an Afghan military convoy, was struck by a rocket-propelled grenade fired by Taliban militants. NPR's Tom Bowman and Monika Evstatieva were riding in a different vehicle in the convoy, and were not injured in the attack. Zabi (as Tamanna was known) worked as a photojournalist for the Chinese news agency Xinhua and wrote for Turkey's Anadolu News Agency. He was working for NPR as an interpreter. "He was a tall man with a warm smile, who somehow managed to couple a casual manner with a quiet sense of authority. It soon became clear that he had a great eye for a story, and that people from every level of society simply liked and trusted him, an essential quality in the journalism business. "Zabi seemed at ease with everyone; he persuaded senior politicians, young male migrants heading to Europe, female victims of war, and many, many more to speak into NPR's microphone — and, by doing so, to shine a light on their nation's unending conflict. "On one unforgettable occasion, he managed to persuade an Afghan people smuggler to sit down and tell us all about his illicit trade over a lunch of grilled chicken and green tea." NPR spoke with Zabi's widow, Fawzia Tamanna, by phone today. She said, "Please tell the world he was the finest man." Zabi also leaves behind three young children — two sons and a daughter. 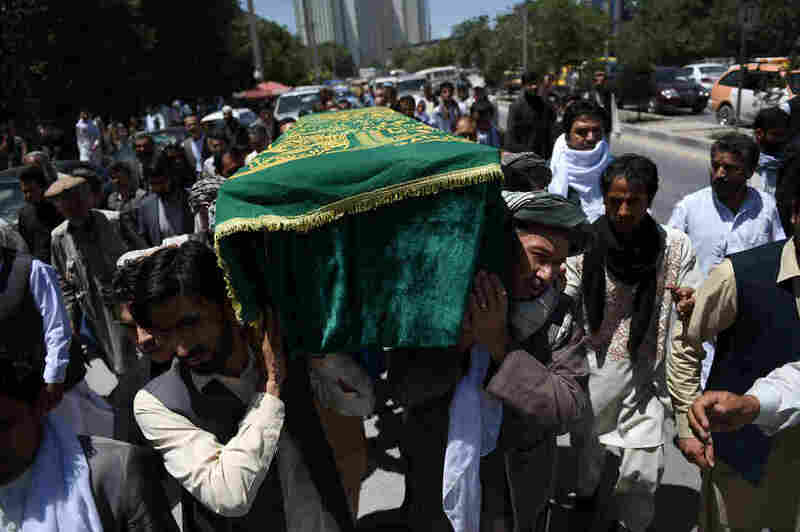 His funeral was held Tuesday, the second day of Ramadan, in Kabul. About 200 people were in attendance, Reuters reports. You can see video of the service here. Zabi's 10-year-old son, Mustafa, said he couldn't believe it when he was told his father was dead, the news agency says. "I feel a huge pain," Mustafa said. "I feel like I am on fire." "This is not Islam," Zabihullah Tamanna's brother-in-law, Mohammed Yousef, said as quoted by Reuters. "Those who committed this act will go to hell." The attack that killed Zabi and David has been condemned by Afghan President Ashraf Ghani, The Associated Press reports. U.S. Secretary of State John Kerry called the attack "a grim reminder of the danger that continues to face the Afghan people."